Looking for a luxurious escape from the ordinary? 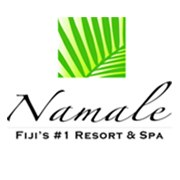 At Namale Resort & Spa, we are the number one all-inclusive Fiji resort. Whether you are looking for Fiji resorts for families or a romantic Fiji resort where you can enjoy a romantic honeymoon, Namale is your ideal destination. The accommodations here at Namale provide only the best luxury experience. From high-end furnishings to stunning views, our bures and villas are breathtaking. In addition to our award-winning spa, we also offer a number of Fiji recreating activities, including Fiji hiking, tennis, fishing, scuba diving and golf. Whether you would rather relax and unwind at the spa or enjoy an adventurous horseback ride or hike through the virgin rainforest, the activities at Namale are sure to impress. Our staff is dedicated to making your Fiji vacation the most memorable vacation you've ever had. We will meet your every request and exceed every expectation. To book your Fiji dream vacation, call 800-727-3454. Namale is located at the northern fringes of the Fijian Islands outside of the quaint township of Savusavu and is referred to as The Hidden Paradise. Namale's 19 units of accommodation are luxurious, intimate and each unique unto themselves with amazing features and amenities that in some cases cannot be found anywhere else in the Fiji Islands. Namale has the most comprehensive range of combined ocean and land-based activities in the Fiji Islands. Some of the activities we offer are 10-pin bowling, virtual golf simulator, over-water trampoline, 9-hole golf course, horse-back riding, Fijian village visits and SO MUCH MORE! The Northern Region is renowned for amazing dive sites and Namale is no exception. Namale divers have access to the Somosomo Straits and the Namena Marine Reserve with both sites being less than an hour away from the Namale Dive Centre. The jewel in the crown that is Namale, is the Namale Spa & Sanctuary, which sits atop 10,000 sq. ft. of volcanic pinnacles. The spa has 4 treatment rooms, a foot lounge, consultation lounge, manicure and pedicure stations, reception area, changing rooms and a hydrotherapy room. The hydrotherapy room is the only one-of-its-kind amenity which can be found in any spa in the South Pacific region. This room offers four aromatherapy tubs, a waterfall massage, a hot tub, a plunge pool and a sauna. The hydrotherapy room experience is heightened by the amazing floor to ceiling glass walls which give Namale guests breathtaking and magical views of the Koro Sea and South Pacific Ocean beyond. Namale is for the more discerning traveler that is used to the finer things in life and demands this when away from home. Namale offers an exclusive, private and luxuriously authentic Fijian experience. We invite you to experience its bliss.